Sometimes the warning is blatant — one woman told me about feeling instantly terrified when a man approached her. But instead of heeding her internal warning, she berated herself for being judgmental — after all, the man had done nothing to her. She talked to him; they became romantically involved; he was, in fact, a sociopath; it ended in disaster. She certainly isn’t the only person with this experience. I specifically asked about intuition in the 2011 Lovefraud Romantic Partner Survey, which drew 1,352 responses. The question was, “In the beginning of the of the involvement, did you have a gut feeling or intuition that something wasn’t right about the person or the relationship?” A whopping 71 percent of respondents answered yes. Forty percent ignored their intuition and continued the relationship anyway — much to their later regret. You’re probably not accustomed to making a decision about someone based simply on your gut feelings. After all, deBecker says, “Intuition is usually looked upon by us thoughtful Western beings with contempt.” We’re indoctrinated with the idea that decisions should be based on logic, rational deliberation and evidence, not feelings. Plus, we usually want to believe the sociopath. He or she is telling us exactly what we want to hear. So we override our deep internal knowing and walk into the trap. Checklists of sociopathic traits are certainly helpful for validation. But what makes you go looking for checklists in the first place? Your sense that something is off — in other words, your intuition. Your intuition, instinct, gut feeling — whatever you want to call it — is a built-in early warning system. By committing to take action based on what your internal warning system tells you, you will save yourself a lot of heartache. What was your experience? Did you receive a warning from your intuition? Did you act on it? Why or why not? Please describe what happened in the comments below. Early on in our marriage , I had a sense of something wasn’t right and started researching on the internet . About 20 yrs ago there wasn’t as much info about sociopaths as there is now. Back then they all described sociopaths as a person who would try to physically harm you . Which we know now is not always true. But my guy let me know that something was off even though I could not identify it at the time . ‘The Gift of Fear’ was probably the book that helped me the most after my 14 year entanglement with a spath. It shone a light on what I now know I felt at the beginning of the relationship (but didn’t understand or know how to interpret in the midst of severe love bombing) and I strongly recommend that all survivors of these relationships read it along with many other great books on the sociopathy and sites like this one. FWIW, I’ll share my experience of what resulted when I ignored my intuition as my guess is is that others may experience the same. Within a year of first “getting together”, I began to experience debilitating sleep issues (dreams which felt SO real, jumping out of my skin at night (fleeing from snakes, sharks, birds etc.) which resulted in my feeling like I had a combination of horrible jet lag and the worst hangover imaginable. I couldn’t focus, felt like I was defective/sickly and generally felt terrible most days. The medical profession sent me to several sleep studies for sleep apnea (negative for that), fitted me with a nighttime dental mouthpiece to diminish snoring and finally, put me on Klonopin which gradually had to be increased to really high doses each night just to get me to fall asleep. A holistic MD performed some tests on me and said my cortisol levels were higher than he had ever seen and compared my system to an AC running on high in the middle of a blizzard. I’m certain that the above symptoms/issues, and those are just a few, manifested themselves because my brain was not (or could not) listening to my inner voice/intuition and so my inner voice found ways to yell at me in louder and stronger ways. Even that didn’t help and I put up with feeling like crap every other day never once considering or understanding who the real source (my ex) of this sickness was. My message here is, there’s an explanation for everything in life and you have to turn over every rock to find answers. Your intuition will only help you if you let it do so. Thank you for sharing what you learned about your sleep issues, and learning to pay attention to our intuitive nudges, LifeIsGood2013. 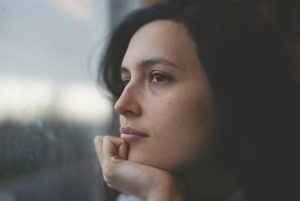 I have 4 major resources that are all urging us to learn to pay attention to our intuition because it will steer us away from toxic people, like sociopaths and narcissists. My default mode is to dissociate and not pay attention. There is a man in my senior complex whose aura reminds me of Peter Pan. He appears to be much younger than he actually is. We’ve never formally met and I notice him in the laundry room. He always makes it a point to make, and hold, eye contact with me – so creepy – but I just keep doing my laundry and don’t speak to him. There is something strange about him. I can feel his energy trying to pull me in. I’m shivering now as I think about this. I remind myself that I am under no obligation to speak to anyone. I don’t know what’s up with this Peter Pan fellow, but I already know I don’t need to find out. My intuition knows, and has given me all kinds of subtle warnings each time I see this guy. Of late, have noticed this type of manipulative energy suddenly makes me very sleepy and tired. Honestly? I’ve grown so bored with the thought of any encounter with this type of person. I don’t have the energy any longer to play cat and mouse games with them, and refuse to do it any longer…even if it is just speaking to someone like this Peter Pan guy. I don’t have the energy to speak to him. I want a life that is fresh and new and vibrantly healthy. The best why to tell if someone is a sociopath, if they make you feel anxious, nervous, or uncomfortable around them. It can be hard to see through them at first with all the love bombing. Some people mistake the warning signs for being in love. Actions speaks louder than words, and a sociopaths words never match up to their actions. 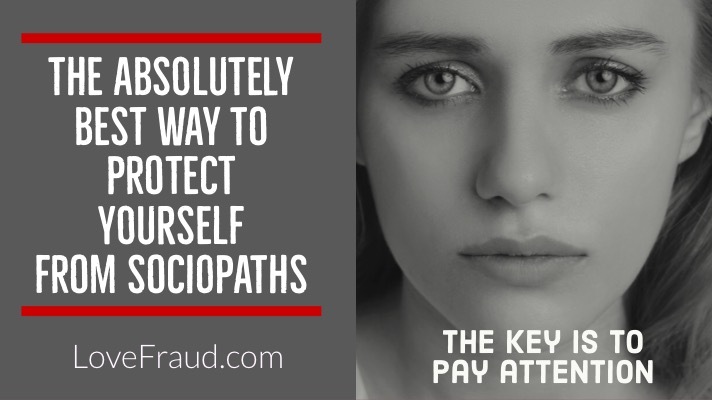 The only way to protect yourself from a sociopath is to avoid them all together. No reason to stay with them to see what really happens, unless you want to learn the hard way. Angelstar….you hit the nail on the head. While we’re being love-bombed, it’s almost a sure thing that we will mistake the warning signs for being in love. For people like us, the unfortunate reality is pain – pathological loneliness, fear of abandonment – is associated with love. Most of the “worst” sociopathic relationship are “romantic” in nature, but keep in mind that you can be equally targeted by close family members (usually a “cash” issue), co-workers and even individuals you have NO relationship with, for example, a potential employer or business partner. I recently got into a mess with a “friend” that I’d known for many years. I was so close to his family that his 3 kids called me “Aunt”. This fella had a messy divorce. The guy is a real control freak type. All you need to do is disagree with him on some subject, like a conspiracy theory- and he’d blow up. He never got physically violent. Not to me anyway. At worst, he’d shun me for a few months. I always thought his behavior was- “limited” to his extreme need to micro-control. NOT SO. I ignorantly allowed him to “move in” with me for a short term after his divorce, until he got on his feet- I’d assumed, a few months. Well, after 3 months I asked him to move out because I couldn’t afford to have him stay with me without paying rent. Well, the guy blew up and was so vindictive that he did nasty things like calling the town health dept. (actually he harassed them with accusations that were either exaggerated or not true) and calling the police claiming that I was “breaking and entering” by own home! The police were totally unhelpful- they told me to evict him. Problem was this guy was a GUEST, not a tenant. I also tried to get a restraining order and the court scheduled a “hearing” three weeks ahead- like THAT was of any help. I even called his church pastor to see if she could talk to him. Nope, she said she had to remain supportive of HIM. So I evicted him myself-without any lawyer, but it still cost me hundreds of $ and he still refused to leave. I was left wondering how could anyone take advantage of a long-time friend? Proving the adage- “no good deed goes unpunished”!!!!! Stupidly, I never considered him a sociopath! Well, that was dumb! DUH….so don’t put it past anyone, even someone you’ve known for 30 years and got along with for the most part, that they don’t suddenly turn on you. Excellent article! Yes, I am SPOTTING and AVOIDING them EARLIER! Recently a man announcing he was just released from the penitentiary to everybody in the “Friendship Room” in my Senior Apartment Complex approached me, and I spotted him IMMEDIATELY for being a sociopath, and I wasted no time getting away from him. Also, I am a moderator for an online support group, when I encountered posts by a new member, bragging how she harmed many people. Immediately I contacted all the other moderators (in the confidential forum for moderators only), expressing my concerns and my fear that we are dealing with a sociopath. Thankfully they agree and she is gone. Thank you, everyone, I am slowly healing! Monicapz … it seems everyone is becoming savvy about the existence and prevalence of sociopaths. As this awareness spreads, hopefully we can take away their ‘oxygen’ and boost them right out of existence – wishful thinking. If you don’t pay attention to your ‘gut feeling’, then please pay attention to your dreams. I’ve read that the subconscious mind is always a step (or two) ahead of the conscious mind; always busy processing information. When I was extracting myself from my relationship with my spath ex, I had the most vivid dreams. They were not frightening, but they were confusing. Interpretation and insight came when I put the imagery of the dream into words, telling it out loud like a story. Then the subconscious and conscious brain worked together and the meaning became crystal clear. One of my most vivid dreams went like this; I found myself in my car, but I was in the back seat. The car was speeding down the street. No one was driving. I was being tossed back and forth as the car swerved, and I was frightened that the car would strike a person or another car – it was out of control! I finally fought my way into the drivers seat and brought the car safely to a stop. I did not recognize where I was, so I asked someone on the sidewalk and they told me – I was in a neighborhood that was miles away, and I hadn’t been there before. Wow – nrnr50 – what a story. Thank you for sharing! the intuitive feelings/sensations/’gut’ feelings were so subtle, either I missed them totally or I ignored them. I know(now after reading webpages like LoveFraud, several books/articles about psychopaths) that these were WARNINGS. Only after years of abusive marriage, divorce and TIME TO HEAL and process my intuition..did I realize what they were. My intuition kicks in much quicker now, and I PAY ATTENTION much quicker. Hindsight usually tells me, these are correct and I was wise to pay attention. I blamed myself back then; I no longer do so (quite so often)..for the distresses/anxiety/body sensations I feel. These are also intuition; everyone is different.